Finding yourself on an 110cc commuter motorcycle on a racetrack can be a bit amusing. And since all of us love to have a good laugh, we had the all-new TVS Radeon for our entertainment during our time at the track. That, however, doesn’t mean that we didn’t test its real-world performance seriously. 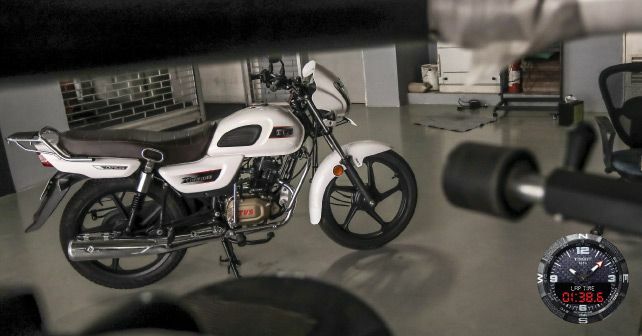 You see, at the end of the day, the low-end commuter segment is what forms the backbone of the major two-wheeler manufacturers in India – as these are the products that keep their cash registers ringing. Coming to the Radeon, it’s TVS’ brand new 110cc commuter that slots neatly between the company’s Star range of 100cc motorcycles and the more premium Victor, with which it also shares its heart. Speaking of the engine, the Radeon is propelled by a single-cylinder 109.7cc motor that churns out 8.3bhp and 8.7Nm of torque. Power transmission duties are carried out by a 4-speed gearbox. Now, of course, riding the Radeon at the BIC was akin to being on a pedal boat in an ocean, which is something that’s also reflected in its lap time. However, you can’t really complain about it, because the main aim of this motorcycle is to provide a comfortable, effortless and easily accessible riding experience. And that’s where it excels. The seat is large and comfy, the dials are big and easy to read, the seat height is quite low and the pegs are placed flat to give you a relaxed riding posture. Taller riders may find the ergonomics cramped, but for average height folks, the riding position is very comfortable. The engine performance is nothing to write home about, but it’s a free-revving motor with a strong low end. The top-end isn’t weak, as compared with other bikes in the segment, but vibrations start creeping in from the handlebars above 70km/h. The handling is neutral, but the suspension is tuned to be on the firmer side. The ride quality, as a result, tends to get choppy at times. All said and done, the Radeon does the job, but it doesn’t have the ‘X-Factor’ of its newer siblings, especially the NTorq and Apache RTR 160 4V. And that’s why it’s appeared at the tail end of our test scores.